How can teacher educators engage pre-service and in-service teachers in learning about and framing their teaching from a critical literacy perspective? What does this mean? Why is it important? To address these questions, this book offers a theoretical framework and detailed examples, pedagogical resources, and insights into ways to build critical literacies with teachers in and out of school. Its unique contribution is to bridge critical literacy theory and teacher education. Participants in teacher education programs and professional development settings are often reminded of the need to build curriculum using children’s inquiry questions, passions and interests but generally this message is delivered only through telling (lectures) or showing (examples from other people’s classrooms). 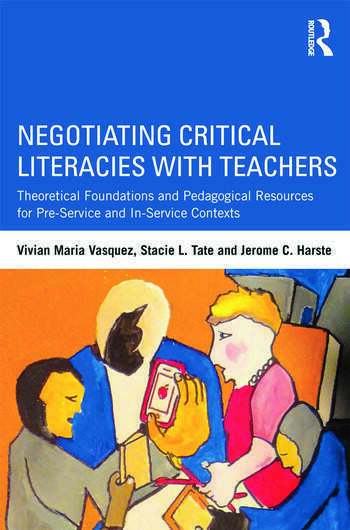 This book advances critical literary by explaining and illustrating how teacher educators can do much more—by creating opportunities for pre-service and in-service teachers to "live critical literacies" through experiencing firsthand what it is like to be a learner where the curriculum is built around teachers’ own inquiry questions, passions, and interests. Stacie L. Tate is Assistant Professor, American University, School of Education Teaching and Health, USA. Jerome Harste is Professor, Department of Literacy, Culture and Language Education, Indiana University School of Education in Bloomington & Indianapolis, USA.